Researchers at the Niels Bohr Institute have introduced a new type of nanomechanical resonator, in which a pattern of holes localizes vibrations to a small region in a 30 nm thick membrane. The pattern dramatically suppresses coupling to random fluctuations in the environment, boosting the vibrations' coherence. The researchers' quantitative understanding and numerical models provide a versatile blueprint for ultracoherent nanomechanical devices. Among others, this enables a new generation of nanomechanical sensors to probe quantum limits of mechanical measurements, and more sensitive force microscopy. The results are published in the prestigious scientific journal, Nature Nanotechnology. Micro- and nanomechanical devices are ubiquitous in Science and Technology: they make watches tick, allow smartphones and cars to sense acceleration, and provide the basic element that Atomic Force Microscopes (AFM) and its sophisticated derivatives rely upon. More recently, such devices have also come to the focus of Quantum Science. Experiments with the most advanced mechanical sensors now probe fundamental quantum limits to measuring forces, testing decade-old, newly relevant predictions from the gravitational wave detection community. Quantum-enabled mechanical devices are also poised to play a role in quantum communication and computing technologies, for example as memory or interface elements. A crucial characteristic for mechanical devices in these applications is their coherence: it essentially quantifies how much (or preferably, little) the motional dynamics are perturbed by random fluctuations in the environment. For a mechanical resonator oscillating at frequency f, a high quality factor Q indicates high coherence (per definition, Q/2pf is the energy storage time of the resonator). At the same time, measuring forces benefits from a small moving mass m. Then smaller forces have a more significant impact on the sensor's motion. Unfortunately, however, these requirements can be conflicting: past research has shown that low mass m often entails low Q and vice versa. Now researchers lead by Albert Schliesser, Professor at the Niels Bohr Institute, have introduced a new kind of nanomechanical resonator that defies this heuristic rule. It is based on a silicon nitride membrane stretched over a silicon frame like a timpano's drumhead. Yet its lateral dimensions are only in the millimeter range, and it is as thin as a few 10's of nanometers (Fig. 1). Its distinguishing feature is a pattern of holes etched through the membrane. The pattern's periodicity gives rise to a phononic bandgap, that is, a frequency range in which elastic waves cannot propagate. This allows to confine vibrations—whose frequency falls into this range—to a central island without holes, which is referred to as the defect (Fig. 2). Given the defect's small size, the vibrating mass amounts to only a few nanograms. Crucially, the hole pattern also boosts the Q-factor of the defect's vibrations in two complementary ways, as Albert Schliesser explains: "On the one hand, it prevents loss of vibrational energy by elastic waves propagating away—this was well known. On the other hand, the holey part of the membrane can still gently move, and thus provide a soft transition between the vibrating defect and the necessarily static frame of the device." Such soft clamping constitutes a novel type of boundary condition to a mechanically compliant element, unlike various forms—'sliding', 'pinned', 'clamped' and 'free'—known to mechanical engineering textbooks. And it is exactly this soft clamping which massively boosts the Q-factor via an effect called dissipation dilution.Indeed, the achieved quality factors of more than 200 million are unprecedented for resonators at megahertz frequencies. Most remarkably, these figures are achieved at room temperature. 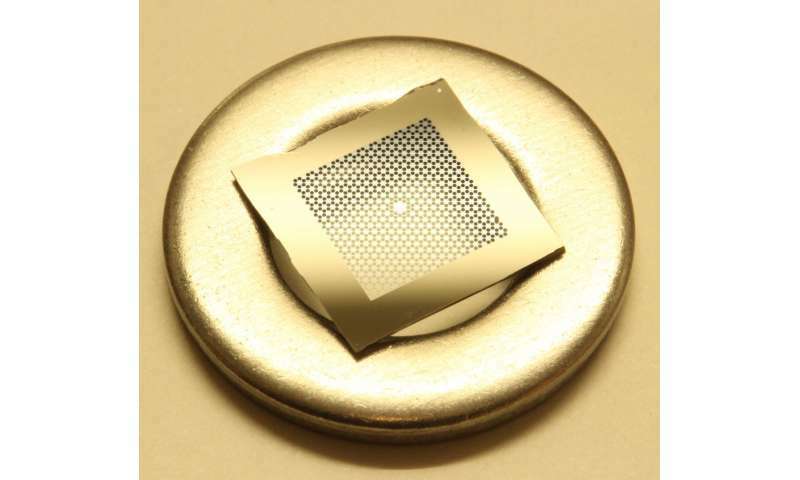 Conventional wisdom suggests that resonators made from any of the widely used materials such as quartz, silicon, or diamond, cannot achieve such high products of frequency and quality factor, unless they are cooled cryogenically. "However, with the right fabrication process, our approach can in principle be applied to resonators of any material, and thereby boost the Q," says PhD student Yeghishe Tsaturyan, who made the devices at the Danchip nanofabrication facility. "This makes this study particularly useful," adds Albert Schliesser, "with our model and numerical simulations, we now have a deterministic, but versatile approach to design and build extremely coherent resonators. This used to be more of a dark art. Now you can take it and adapt it to your requirements." But the record-high coherence of the devices created in the present work is already attractive for a number of applications. Especially experiments in quantum optomechanics will massively benefit from the nearly 100-fold enhanced coherence, compared to first-generation membrane resonators. Forces associated with quantum vacuum fluctuations are expected to be extremely prominent, allowing detailed studies of their effects also in complex settings and, eventually, room temperature. This will allow new investigations of quantum limits to force and displacement measurements, concepts highly relevant not least for the design of gravity wave detectors. Another avenue of interest is to use the membranes in magnetic resonance force microscopes (MRFM). Similar to an AFM, these instruments are based on a force measurement, and achieve extreme spatial resolution at the nanometer scale. Unlike AFM, MRFM images magnetic properties of the sample, comparable to MRI scanners known from clinical use. At its full potential, MRFM promises no less than chemically selective 3d-images of, for example, a virus at molecular resolution. This would allow new insights into structure and function of biological systems at the molecular scale. The holey resonators introduced at the Niels Bohr Institute could help approach this goal.